This was a touching moment to all who were in attendance at this wedding. The bride had been previously married and was blessed with a beautiful daughter who was the light of her life. She wanted her daughter to play a role in her wedding and nothing could be more fitting than walking her mom down the aisle to the alter and to the man she would marry. 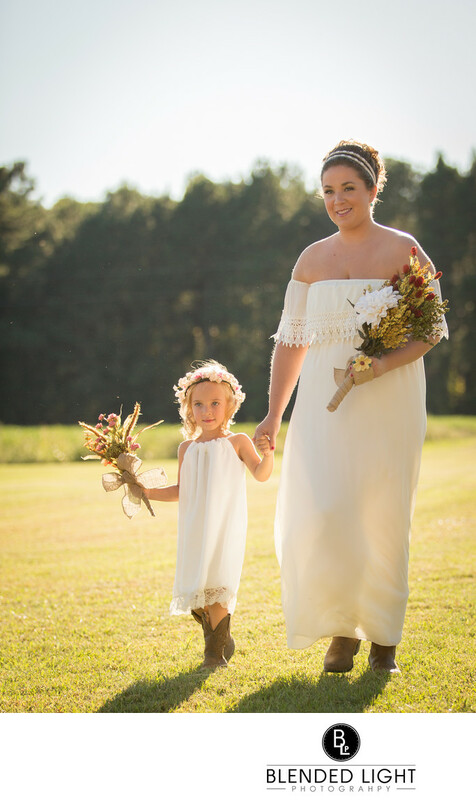 Dressed in similar dresses and cowboy boots with bouquets in hand, they held hands on this beautiful October day with the sun on their backs and not a cloud in the sky. Truthfully, I don't know who was more excited - mom or daughter! The ceremony included a special something for this darling little girl. Her new "dad" presented her with a ring too - a promise to always work hard to treat her like his own, to love her everyday, and to do the same for her mom. There was't a dry eye among the guests during that part of the ceremony. On the day her mom got married, in a different sort of way, they saw her get married. I was blessed to watch these touching events and provide the bride and groom with images of both. 1/1000; f/2.8; ISO 100; 95.0 mm.